Discussion in 'Concentrates' started by Simple10, Apr 21, 2017. Simple10 Member, you member riiiight? Has anyone here ever tried the Vapor Slide V-1? A WP vaporizer specifically for oil concentrates looks very intriguing. I think you can load a whole gram in the cartridge instead of having to reload a dab every few hits, possibly making this thing the easiest most convenient way of dabbing for a large group session or party! Anyone with 1st hand experience? PPN and snamuh like this. Anyways this is an interesting innovation of the standard oil cartridge. Those look like 510 threads so you should be able to buy a replacement cart at a dispensary (if it breaks or you're too lazy to refill). Looks like it's able to be used standalone (just like a normal pen). I'm not a fan of how far down the cartridge sticks into the piece. That makes it incompatible with certain pieces and will likely become sticky. Definitely better for a party than an enail/torch. Easy to pass around and minimal if any instruction is needed. In terms of the home user, it won't be as tasty or as potent as a dab, but this seems like it'd be more consistent (along with having zero warm up time). Vapology, PPN and Simple10 like this. The Hercule is already offering this feature....Is there any mention about the cleaning? could you dismantle the unit for an iso soak? What the coil is made of? Vape Donkey 650 likes this. I'm not sure I understand here, it looks like he's putting distillate into it? This wouldn't work for more stable waxes at all. I mean even then, I have serious doubts that this looks like anything more than a regular old atomizer to me? Made to fit into a bong? They've added an o-ring to the outside of a cartomizer is all. It would clearly work well with a standard PeG concentrate mix like regular carts, but that's all I see it working with. Edit: I also realize there's the yocan torch for portable water pipe wax vaporization at almost a quarter of the price. That uses regular coils though, as opposed to a concentrate PeG mix like this one does, which just means you use whatever you have off hand, too. Vape Donkey 650 and PPN like this. Ok I ended up ordering one of these and its awesome. Hits much harder than the average oil cartridge n e-cig battery but not as hard as a nail; more like just slighty less potent than the Yocan Torch. Their cartridge holds about .75g worth of a 1g CO2 syringe I got at my local dispensary. The need for a lighter to keep the cartridge warm makes it kinda cumbersome to load but it won't be a problem if you're used to loading e-juice tanks. I've had it for over 2 weeks now taking approx. 6-12 hits every night and I still have half a tank left. The only issue is that the cartridge/mouthpiece or O-ring could be thicker/wider, the narrow cartridge submerges too deep into the 14mm joint. But if I use a m to f adapter it's all good. It looks like it might fit in an 18mm M joint without an adapter. Prolusio and Vape Dr. like this. Update: Currently my nightly driver I use before bedtime since there is no cleanup after a session. The battery lasts me every 1 & 1/2 tanks and a tank will last me about 3 weeks taking 4 to 6 rips per night. I use oil from the brand THClear, it is runny enough so that it will pour down to the bottom of the tank without the need of a lighter. If you often buy pre-filled oil syringes from dispensaries, this thing is a must have! I've seen this one on alibaba ,it is made in China for sure . Even harder when the metric measurement is of volume, not mass. Volume is not an appropriate way to measure cannabis extracts, as 1g of one kind of extract may occupy a very different volume of space (measured in ml) to 1g of another kind of extract with different physical properties/consistency! It is true that the relevant extracts are often sold by volume and not mass however - but IMO it is still not the most relevant information for a person buying an extract. This definitely seems to be a competitor for ecig tanks, rather than those solutions designed for vaporization of only essential oils which usually are not runny enough for this kind of cart. Seems like another bubbleman trinity style cart to me. I wonder if the materials are safe in this one too? One good thing about this one is it seems to be made to connect to a bong, that is something that I wish other vendors paid attention to! davesmith, 2clicker and Vape Donkey 650 like this. I picked up a vapor slide and made a video for you all. I love it. super convenient instant draw, awesome taste. Simple10 and Silver420Surfer like this. Vape Donkey 650 All vape, no smoke please. sigh...i cry a silent, metaphorical tear whenever i see companies peddling "vape gear" like this. First off, anyone with an ounce of imagination or creativity can transform any standard "vape pen" into a "vapor slide"
Look, I made this "vapor slide" with a crappy, obsolete kanger pro-tank (noob tank) II on a generic unregulated 510 battery, and a rubber gasket / stopper. Total cost (in the year 2013) about 20 bucks. Add in the actual D-020-D9 bubber, and we're about 60-65 bucks total cost....and they want 99 bucks for a "vapor slide" ? I just threw that together right now to prove a point, I wouldn't actually pollute myself by trying to use that crap in the year 2017, or 16... or 15? I have been making "vapor slides' for a while. This is a nostalgic throwback of my 2014-era vape gear, just right before cheap temp control mods stormed the market en masse. My "slides" were using "load-as you-go" glass globe microskillet atomizers with a plastic tube back then, so you would not want to invert the atomizer and insert it directly into the glass joint of the rig, to avoid splashing, and you would have to reload the atomizer every several hits (how hard is that?) but then you also gain the ability to vape "any kind" of dab-worthy concentrate, no matter how viscous or runny it is, with no need to add PEG or extra terpenes. Yes, somebody is recognizing this thing for what it really is! Just a glorified, standard vape pen atomizer cart with an o-ring and a bigger battery! The only difference I can see is the coil / wicking holes are inverted, near the mouthpiece / exit of the tank, rather than the other end, since this is intended to be used inverted / upside down from the standard position. The battery is not even a temp control mod! Not that these high-resistance tanks can operate in temp control mode, anyways. I wish more people would understand, variable volts / watts control is not temp control. From setting the battery anywhere from 3.3v to 4.6v, or whatever the range is, what you're really changing or controlling is more like "burn a little bit" to "burn alot" Even at the low voltage range, if you hold the button down for only a few seconds, the tiny metal coil quickly can reach burning, red hot temperatures, even with airflow and oil putting a cooling load on the wire. Setting that battery to the higher volt range surely results in putrid, burned hits. I wonder what type of vapes people are bench marking the flavor of this "vapor slide" against in thinking that this type of combusting vape gear actually tastes good? People tend to demand better of their flower vapes these days, if more people were aware of how crude and hot these little metal coils can get (easily 600-1000F+) I don't think they would tolerate them as much, and it might even force the market to come up with better solutions! Would you want to put your flower in a 600F oven or touch it to a 600F+ wire? (No?) Then why is that ok with your oil? And also, does this "vapor slide" battery lack a fire button? Many pre-filled 510 carts don't support that feature, so that's a large portion of the market that this battery can't even work with? Is there any mention about the cleaning? could you dismantle the unit for an iso soak? Doesn't seem like you could fully dis-assemble the atomizer, just the ability to remove the bottom/base of the atomizer from the glass body of the tank for filling. No interior access. I would guess it's a high-resistance kanthal or titanium coil with a wick made of cotton or silica fiber. They don't mention "cCell" or "wickless" which would be slightly better. Cheap imitations, counterfeits, and DIYs, why pay 99 bucks? Made in china? Only like 99% of all the other vape pens / atomizers / RTAs / RDAs / box mods / mech mods! And herbi...if you really think someone will make a tank atomizer for your "6-star bubble" or BHO, shatter, etc, that can be used without adding PEG and/or terps...I hope you're patient...it's not going to happen for a long time, if ever. For concentrates that don't act runny at room temperature, we're all better off breaking single little BBs/dabs of oil for vaping in small amounts and single sessions, as we need it, for our e-nails / wax pens. this is the latest iteration of my "vapor slide"
The compromise? You need to reload it / clean it more frequently with use. Seems like an easy trade-off to me. Mr. Gweilo 420, Vapology and shredder like this. The atomizer is more than just inverted, it's designed to vaporize more oil at once without burning it. Only at the highest setting do I notice some burnt taste, but if set at 4.2v I get the biggest clean hits I've ever gotten from an e-cig battery. The only drawback is the natural trade-off: Bigger hits = using up your oil a lot quicker. Besides with those other pre-filled oil cartridges, often times the atomizer fails or begins burning instantly before the oil is even close to running low. I've refilled this many times, still hits like new. And the cartridge is also universal 510 threaded so you can just buy that separately for 7.99 to use with your own battery/vape mod. No whip tubing/WPA setup needed, except for maybe a basic double sided joint adapter to avoid letting the cartridge sink too deep into your WP. It works fine with my basic 10-dollar ecig battery but I still get bigger clouds using the VS, even in the lowest setting. The battery may be overpriced but then again I've never seen any other battery/vape mod that is both voltage adjustable and has instant draw activation. Of course there are cheaper and more satisfying ways to vape your concentrates. If that's your main concern, this is not the device for you. 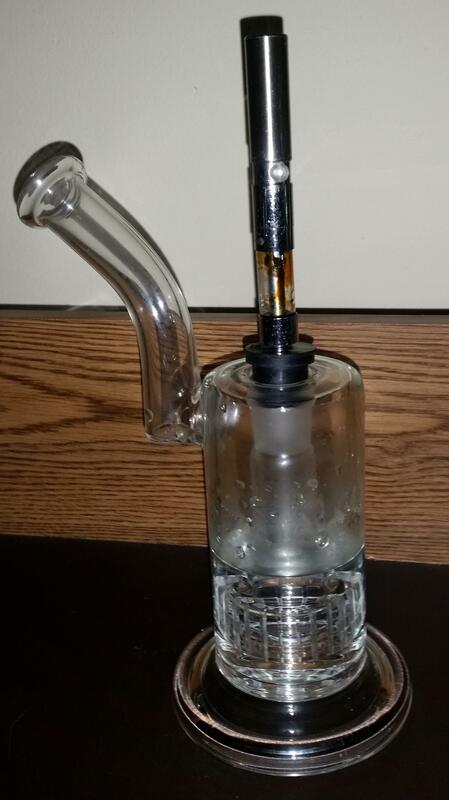 The point of this thing is to offer the convenience and simplicity of a CO2 oil cartridge to the WP/dab rig experience. 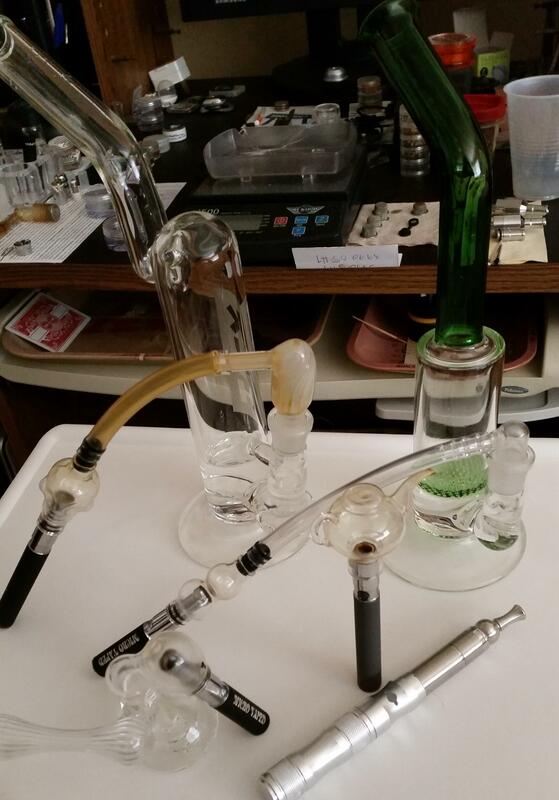 Very minimal setup and cleanup before and after a session, just stick it in your piece and draw. There is No learning curve as well, any draw technique will work. My friend who loves dabbing but finds the whole enail and torch setup kinda intimidating, now uses this as her daily driver. If you already have a VV battery, then just buy the cartridge and try it out. PPN and Abysmal Vapor like this. I saw these guys at a pop up earlier this week and was more impressed than I had expected. I had seen the VaporSlide around the net, but in person it felt well built and of a much better quality than my other pens. Unfortunately, it was not a demo so I did not get to try it; but I was impressed and can see how it is a simple, no-fuss quality solution for those who like carts and want to use with water. ... Their rep also mentioned they have a v2 in the works. 2clicker, PPN and Vape Dr. like this. Yes there is a pre-sale on their website for the V2 for 59.99$. There is a shatter Slide pen planned for the end of 2018 but it's priced at 199.99$, not on the cheap side but I will keep an eye on this one! edit: Is the vapor Slide only working with CO2 oil or is it working with a solution shatter/terpènes (or ej-mix) like the W9's cartridge (Trinity tank)? I got to try one at a show and loved it. Solid build, works native or with glass. Can use prefilleds and was designed for distillate. Hey all I just received my vapor slide V2 (version 2). Here is a quick unboxing video. Simple10 and 2clicker like this. My understanding is that the main innovation is putting the coil up by the "mouth piece" end (that is, at the bottom when inserted into a WP) which just the opposite of all other carts I have seen). I Just received my Vaporslide V2 Plus! Here is my quick unboxing video. Guess you can only get these direct from their website? Even harder when the metric measurement is of volume, not mass. Haha trust you to pull that up i was just gonna say the same thing! I use normal cartridges with the vapor slide through a water pipe all the time with no issues. The beauty of the Vapor Slide cartridges is you can leave them upside down in your water pipe just chillin, ready to rip at a moments notice . Here is a quick video showing how crazy easy it is to fill the vapor slide cartridges. mixchu69 and biohacker like this. I can't believe how under the radar this device is!? Going to pull the trigger, and there are some stellar deals on the previous versions! Looking forward to the co2 oil dab experience! It has been my main daily driver since I got it. That's awesome dude! How many re-fills you figure out of the top coil? Do you ever using a CCell Th2 bottom coil with a water tool? Still can't believe how underrated it is! Is it worthwhile picking up the v1 for the price?